If you entertain a lot and want to spend time outdoors, an outdoor kitchen will help you combine both interests with greater ease. Whether you have a large garden or a small yard, an outdoor kitchen that is well designed can help you spend time outdoors, cooking and serving food even as you spend time entertaining family and friends. The design of your outdoor kitchen will depend on the space availability, budget, and the types of gathering you plan to host. Gas or charcoal grills can help you prepare food outdoors. The choice of grill will depend on whether you can pipe gas to the outdoor kitchen with ease or not. Moreover, piping gas outdoors might also require permission from the local authorities. If your outdoor kitchen is close to the kitchen you can install a gas grill, otherwise, press the button for a charcoal grill to serve hot and delicious food outdoors. The outdoor kitchen should have at least some storage facility. This will enable you to store basic ingredients, cutlery, and plates in the kitchen, saving multiple trips back to the main kitchen for essential items. Having salt, pepper, napkins, and cutlery as well as a few sauces and condiments will mean the difference between rushing back to the main kitchen and spending time, enjoying the company of your guests as you prepare and serve the food (of course you could have some help or a child run quick errands for you back and forth). Stocking up the outdoor kitchen before a party of get together will make for a better meal time for sure. The outdoor kitchen should also have a sink and water supply. While a sink can be installed with ease, water supply will require you to lay a pipe and obtain planning permission. However, a sink and faucet will help you wash your hands, the glasses and other dishware after you serve the guests. This will also help in expediting the entire cleaning up process. Since you can wash the used dishes in the outdoor sink and stack clean dishes together to be taken inside if necessary. You can do this while still experiencing the gorgeous outdoor moments and activities. As most outdoor cooking and entertaining happens in the warmer months of the year, a refrigerator will enhance the comfort and value of your outdoor kitchen. You can store cool drinks and ice in the refrigerator apart from chilled salads, sauces, and even ice cream. This makes it easier to host an outdoor event, as guests can simply grab a cool drink as they wait for the meal to be served. A compact refrigerator that can fit under the counter top will help you store party essentials close at hand, sparing you the hassle of rushing back to the house every time someone wants a cold drink, some ice, and so on. An outdoor kitchen should have plenty of task lighting over the counter top and cooking area. This will enable you to use the space in the evenings and nights as well. Whether you are planning to host a poolside party on summer evenings or want to spend time outdoors on moonlight summer evenings with your family, adequate task lighting over the counter top and cooking areas will mean that you can spend time outdoors even as you prepare meals and eat them. You can fix permanent seating close to the outdoor kitchen in the form of wooden or wrought iron benches and tables, or use stackable, movable, chairs and tables. The permanent benches and tables will mean less work when you are hosting a gathering as you do not have to arrange tables and chairs. However, if you have a small garden or want to have flexibility in the seating arrangements, you could invest in foldable, stackable outdoor furniture that can be used in multiple parts of the garden. For instance, you can use the same set of plastic chairs close to the outdoor kitchen, near the pool, and on the patio or deck, depending on where you want to spend time outdoors. Moreover, this type of furniture can be stacked and stored in the basement or attic when not in use or when the weather is very hot or cold. 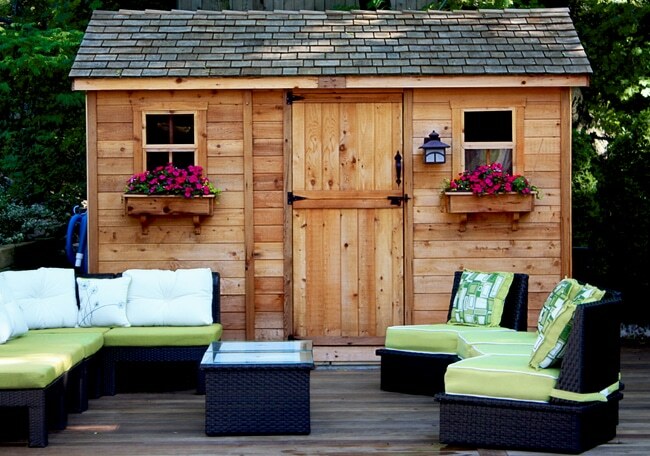 But an outdoor shed is much better for this type of furniture! A properly planned outdoor kitchen is a terrific way to increase the time spent outdoors. By simply transferring meal preparation and meal times to the outdoors, you can spend more time soaking in the sun or enjoying the fresh breeze in the evenings. Spending time outdoors will help you relax and unwind and mentally prepare for the day or week ahead. Grilling your favorite foods outdoors will enhance the flavors and make mealtimes more enjoyable.